Image caption The script translates: "There is no God but Allah and Muhammad is the messenger of Allah"
A school district in the US state of Virginia has closed all schools on Friday after a geography lesson that included Islam sparked vociferous complaints from around the country. 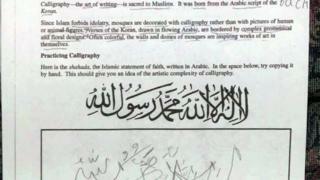 Students were asked to trace Arabic calligraphy in an exercise some parents said amounted to indoctrination. Officials said the schools were closed out of an "abundance of caution" and there were no specific safety threats. School administrators say a different lesson will be used in the future. One week ago, students at Riverheads High School were studying the Middle East and were asked to trace a piece of Arabic calligraphy that translated to: "There is no God but Allah and Muhammad is the messenger of Allah". Some pupils refused the assignment and parents accused the teacher of indoctrination. Officials with the Augusta County school district were quick to point out that the study of a region's religion and language are included in geography lessons. However, anger built up and by Wednesday complaints had become so numerous that the school's doors were locked and monitored. By Friday, the messages - described as profane and hateful - had increased and the decision was made to close the schools. Officials said that no specific threats were received, but law enforcement officials and the school district board recommended the closure because they were being cautious. The lesson was intended to illustrate the complexity of the Arabic language, they said, and not meant to promote any religious system. But future classes will use a different, non-religious example of Arabic. The decision to close the schools has drawn criticism as well. "It looks like fear wins again," a resident told the News Virginian newspaper. On the paper's Facebook account, locals have been debating the closure with one man saying, "our patriot forefathers are rolling in their graves," and another rhetorically posting, "how do these terrified people leave their houses every day?"